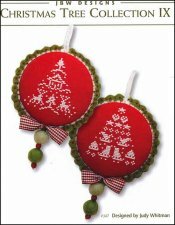 Christmas Tree Collection 9 [E6152] - $10.00 : Yarn Tree, Your wholesale source for cross stitch supplies. Cross stitch pattern by JBW Designs. "Oh Christmas tree, oh Christmas tree," can you hear the song playing while you stitch these beautiful white Christmas trees? Look closely at the first tree (Chalet) where you will find a couple of reindeer, a house & a couple of trees with falling snow, all formed to make the tree. The second tree (Winter Wonderland), you will find a couple of sleds, a pair of ice skates, bright shining stars, etc., all formed to make the tree. These designs would be pretty to stitch into ornaments for your Christmas tree! Stitch count for Chalet is 35W x 40H. Stitch count for Winter Wonderland is 39W x 38H. Stitched on #2341 Zweigart Belfast Linen Christmas Red 32ct. Pewter Aida 14ct Short Cut 12"x43"